Jurassic Park Slot Machine Picture If it’s superb graphics, cinematic movie like action and plenty of features that you are looking for, then Jurassic Park non-progressive 243-Ways 3D cinematic and animated slot is one of the top contenders if not the top contender. 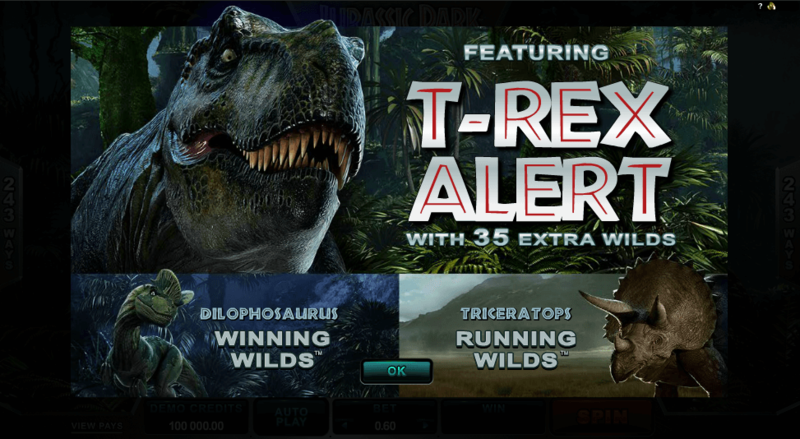 Spin the reels a roll your way into T-Rex alert action when the ground starts shaking putting the fear into the reels with 35 additional wilds helping you get massive pay outs from combination wins. 4 Free spins rounds unlocked the more you play throwing in Dilophosaurus Winning Wilds, Triceratops Running Wilds, Mystery Multipliers with the Brachiosaurus, and more madness when the Tyrannosaurus Rex Wild Reels kick in , guaranteeing you get paid well from any of the free spins bonus rounds. That’s not all, stacked symbols, 6 of a kind symbol combination wins and a skill stop feature add to the mayhem on a non-progressive slot that literally has everything. As with the movie, the slot is full of action, awesome scenes and high quality real to life animation. This slot replicates the movie in every way possible with a myriad of features to boot. This is arguably the best slot out there and with its popular theme, you can guarantee that you’ll be regularly spinning in cash wins. Immediately, the 3D animation and cinematic action movie clips stand out. You will know Microgaming has really gone out of its way to bring to the virtual screens something truly special. During the bonus round dinosaurs wage all-out war fighting it out right before your eyes across the reels plunging symbols off the reels and leaving behind them wild symbols that will help you pull in fearsome wins. At the forefront of it all is the scatter symbol leading the way to riches in a dense jungle background where there is tons of cash to spin into your back roll. 3 plus scatters will instigate the start of one of a handful of features that will get you into the money. Stacked wilds, mystery multipliers, split wilds helping you land 6 of a kind combos, winning wilds, running wilds, wild reels all part of a massive free spins round where literally missing a paying feature seems almost impossible. Honestly, there is no faulting the new Jurassic Park slot machine. It has 243 ways to win giving you no pay line symbol combination pay outs making it easier to line up winning prospects compared to the fixed payline slots, there is always a wild symbol feature to bring more cash your way – particularly the random T-Rex Alert. If we were ever to recommend a slot that has everything, then this is it. Spins are relatively cheap starting at $0.30 too, so there is no need to break the bank to get into the action, and it comes with an RTP of over 97%. During normal play the T-REX is the main substitute symbol. It is a wildcard and can act as any other symbol in the game. That means if you line up 2 symbols that are not on adjacent reels and the T-REX wild is in the middle, the T-REX will act as one of those symbols in order to complete the combination for a winning pay out. Similarly, if it lands on the end or at the start of a set of symbols, then it will extend the symbol count in that combination. However, the T-REX does not fill in the scatter symbol. It can only become a wild card for any of the normal symbols on the Jurassic Park online slot. This is a totally randomly activated feature that is always welcome. As in the line of films themselves, the T-Rex can turn up at any moment. The T-Rex bonus alert works on the same principles activating 35 additional wilds on the reels over the next 6 paid spins. With more wilds on the reels, you are sure to come roaring in with more wins. Be aware of the most valuable symbol in the game because it is the key to landing a huge amount of cash. The Mosquito inside the Amber tree sap represents the Jurassic Park scatter symbol. When this lands 2, 3, 4 or 5 times on the reels, you get your first bonus. This is 1x, 2x, 20x or 100x the total amount of cash you wagered on the spin. That means it counts all bets across all lines and all coins, totals up the cash value and multiplies the amount to determine your win. One of the most exciting features about the slot aside from the dramatic action and 3D animation is the amazing choice of free spins rounds available to spin out a total of 25 free spins awarded. In total, there are 4 free spins rounds to choose from, however when you begin playing the slot, with any one of these free spins randomly selected. Then, the more you play, the more free spins rounds will unlock giving you the choice to choose the free spins round you want to play. It will take a total of 25 free spins rounds to get to the stage where you can choose which one you would rather play. Just as a side note, the slot will save your progress, so you can always come back to the unlocked free spins round without having to go through the entire process all over again. A cool animated round whereby the Dilophosaurus comes alive in an animated charge across the reels smashing symbols apart and turning them into wild symbols. You’ll also have Dilophosaurus wild symbols stacked up on the reels giving you loads of wildcard symbols to link up with other symbols. Only 12 spins will be awarded in the Triceratops Running Wilds free spins round. Running wilds is a stacked wilds system whereby the wilds keep stacking one symbol higher every spin. By the end of 12 free spins, the wilds will stacked up to 15 symbols high. There is in addition a Triceratops stacked wild rolling the reels giving you a T-Rex sized number of wilds spread all over the reels. During the latter spins in the game, the symbol wins start to become increasingly larger. Again, 12 free spins are awarded for this round. What makes this free spins round stand out the most is the random multipliers that increase on the reels after every spin. Every win will have these multipliers applied increasing the size of your wins every time. Perhaps, the biggest and most lucrative free spins on the Jurassic Park slot. The T-Rex will literally overtake the reels with a magnificent animated 3D display showing the T-Rex in motion with all it glamour. When the T-Rex does come onto the reels, expect the entire reel to turn into wild symbol, with all 5 reels dishing out massive wins. You will that Velociraptors always hunt in packs, and as with the movie, it is no different when the Velociraptor Multipliers and Split Wilds feature kicks into action. Animated Velociraptors swiftly dominate the reels in a 3D action clip and slice wild symbols into two pieces. If that wild has completed a combination, it will extend the combination by 1. If you happen to have landed a 5 of a kind, then you will have a mega 6 of a kind symbol pay out – the normal pay-out amount will then be doubled. Additionally, the Velociraptors rip up more wild symbols changing them into multipliers worth x4, x5 or x6 the regular value. Use this feature to skilfully stop the reels after you have set them in motion. With a skilled press of the button, scatters or wilds can land again giving you the chance to win more cash. You can also use this feature to speed up your game by stopping the reels quicker in order to get the next spin going as quickly as possible. On the Jurassic Park slot you can wager up to 10 coins per line worth $0.01 to $0.05. The minimum number of coins you can use is 30. You can increase the number of coins per line in multiplies of 30. For example, 30, 60, 90, 120, 150, 180, 210, 240, 270 or 300 coins a spin.